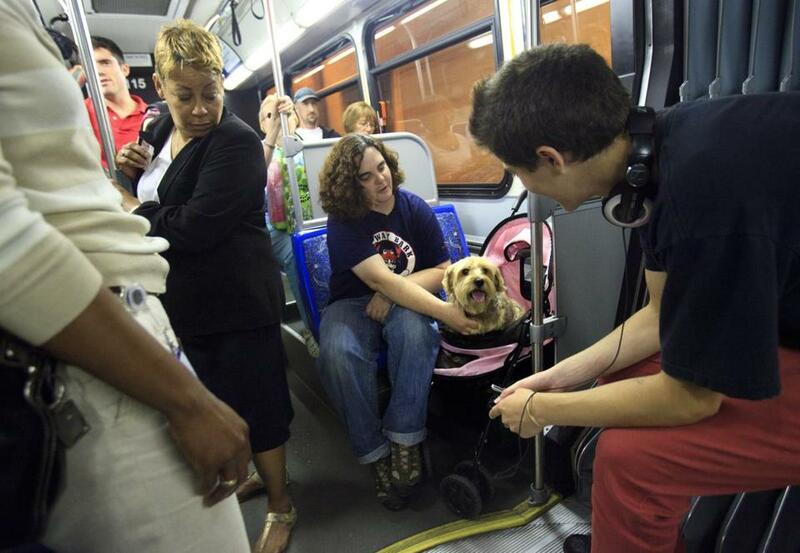 Maureen Berry commutes from Roslindale to work in South Boston with Nicholas, her 13-year-old Yorkshire terrier, in his stroller. Really, it should be no big deal. After all, we already live in such a pet-centric world that the sight of a dog wearing Ralph Lauren, or checking into a five-star hotel, or dining on organic, locally sourced food, barely causes a stir. And yet, even in 2012, a dog riding in a stroller seems one pamper too far. No one knows this better than April Soderstrom, or, as she’s recognized in the South End, the blonde tooling around with a 35-pound French bulldog in a jogging stroller. Berry and Nicholas enjoying a walk at the waterfront. Let the public mock. The white dog with the big pink ears has long struggled with a bad back and hips, but he got around OK until a few months ago when he injured a knee, making the two-block walk to the park impossible. “But I wanted to keep him happy,” Soderstrom said. Two Pekingese pups were spotted recently in a stroller in the Prudential Center. A Yorkie was seen riding in the South End, where a cat was also observed taking a drive. In Cambridge, a long-haired dachshund was parked in a stroller in front of a Star Market. 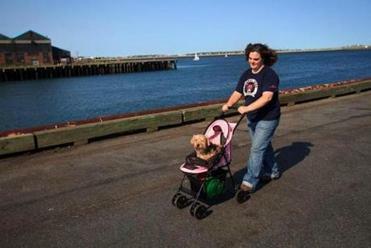 Reports of stroller dogs enjoying Castle Island and the Gloucester waterfront have also come in. The stroller movement is the natural outgrowth of several other pet-related story lines, including an increase in spending on pet health care, a growing population of elderly pets, and an increasing belief that our pets are not our animals, but rather our children. In 2001, US pet owners spent $7.1 billion on pet health care, a number that jumped to $13.41 billion in 2011, according to the American Pet Products Association. Along with that spending has come an increase in the percentage of senior pets who, having benefited from life-prolonging therapies, need help getting around. But strollers aren’t just for infirm or elderly pets. Some are for perfectly mobile pets who are more child than pooch. Because dogs can be zipped securely into their strollers, the carriages allow pets to accompany owners on an entire day’s worth of activities. Louis, April Soderstrom’s French bulldog, has back and hip issues, so a stroller helps get him out for walks. Time was when dogs like that would have stayed at home, but that time is not 2012. In fact, Vogel and her husband, a muscular mixed martial arts fighter confident enough to push a dog stroller, are so eager to bring their dogs along that they have assembled a stroller wardrobe, one for off-road, one for in-town. “Our son is in college and [the dogs] are the second kids,” Vogel said, laughing. The stroller trend started to build about five or six years ago, said Tierra Bonaldi, a “pet lifestylist” with the American Pet Products Association, and it’s moved from strictly small-dog doll-style strollers to joggers strong enough to hold a 150-pound dog, and manly enough for even macho men to be seen with. 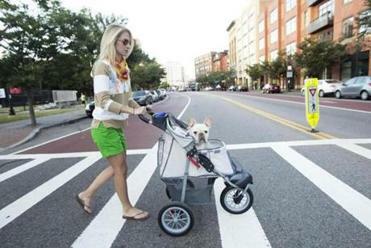 In South Boston, a pink stroller emblazoned with paw prints allows Maureen Berry, an assistant manager at the Fenway Bark dog hotel, to commute from Roslindale with one or two of her three dogs. The trip involves the Silver Line, the Red Line, and the Orange line, and wouldn’t be doable without wheels. “What do you think, bud?” Berry asked on a recent afternoon as she and Nicholas, her 13-year-old Yorkie, left work. The 18-pound pooch, youthful but with mobility problems, sat upright in his carriage, the wind of Boston Harbor ruffling his tan and black fur, his adorable black nose sniffing like mad. Berry scratched his head and smiled as the pair made their way home, together.